Irritating insects such as bugs and mosquitoes will not let you enjoy your outdoor living areas. They are not just annoying but also harmful especially those that carry viruses. That is why you need a Best Electronic bug zapper that is both effective and safe for the environment. Flowtron BK-80D Electronic Insect Killer is an exceptional choice of a bug zapper that is solidly and durably constructed. Also, comes with unique features that will see to it that your outdoors are safe for fun and entertainment. If you are looking for an flying insect zapper that will cover a wider area, you will love this device. Flowtron BK-80D Electronic Insect Killer will free space of up to 1 ½ acres of pesky insects. This extensive area coverage will ensure that your home is safe and conducive for indoor and outdoor activities. You can comfortably entertain guests on your patio or allow your children to play in the garden with minimal worries. This 80-watt version of Flowtron Bug Zapper is compelling and hence the best to use for the paramount results. There is no doubt that it will rid your home of frustrating pests in no time after it's application. It's bulbs can last for a very long time. Giving you extended time of service before they require a replacement. Some people have enjoyed up to a year of bulb usage. It can be a little noisy though and hence disturbing for humans and frightening for your pets. This can be avoided if it is set up a few feet from your patio, doors and windows. Flowtron BK-80D electric insect zapper has been constructed to serve a more extended time service. It is rugged and solidly built to be able to resist cracking even when it falls. It is rustproof too and safe from fading. This keeps it in excellent working condition for a long time. It can also withstand even the harshest weather, especially for efficient outdoor use. You, therefore, do not have to worry about leaving it out in the rain. In addition to its friendly cost, you also get value for your spent dollars; and for a long time! One or two stray bugs will create a significant discomfort to you. Therefore, you do not need a bug zapper that will leave even a single insect roaming or flying around your house. The use of the Flowtron BK-80D Electronic Insect Killer will ensure this does not happen. The device ensures that all the insects are eliminated within its range of use. This translates to comfort and an insect-free space. 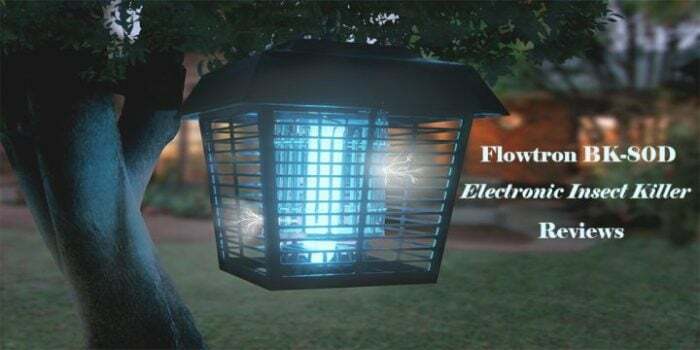 The flowtron electronic insect killer pretty lantern will not just attract insects but also keep your outdoor space well lit. You will not require extra security lighting as long as you have set up the insect killer. The flowtron bug zapper produces high-intensity UV light works like magic in attracting insects and lighting the outdoor space. After a night free of annoying insects, you need to clean your Flowtron bug zapper for the next time. The good thing about this insect killer is that it features a non-clogging grid that prevents build-up and accumulation of dead bugs, which can be damaging to the device. It does not require much maintenance to stay in good working condition. This means that you will successfully rid your home of pesky bugs without doing much. Even though the best insect zapper costs a little more than most of its competitors. It will be less costly in the long run. This is because it is terribly energy efficient and hence very economical. It only runs for a few pennies in a day. This, together with the fact that you might just replace its bulbs once in five years makes it a very affordable option. When thinking this may be an expensive option for you, remember “cheap is expensive”. Do you need an insect zapper you will need to replace now and then? Guess no; the bugs and insects will always be there to create the distraction you so very much detest. Therefore, you need a fairly expensive but long lasting device such as the Flowtron BK-80D Electronic Insect Killer. An efficient and affordable electronic insect killer is the way to go if you want to rid of annoying and virus-carrying insects in and around your home. The Flowtron BK-80D insect killer is a compelling device in attracting and killing insects that come into contact with it instantly. It features a non-clogging killing grid, a feature that is hard to find in most insect killers.